Instructions: Diecut Intricate Swirl Frames die using the kraft cardstock. This will be your card base. Now cut a piece of patterned paper from the collection and glue it on the frame front approximately 3.75 x 5.75" which will lay perfectly in the center. 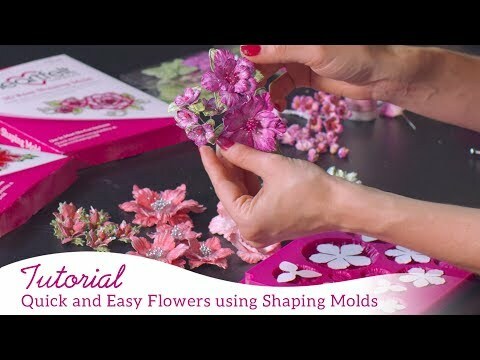 To create your blossom, you will need to stamp and diecut 12 blossoms using a mixture of the large, medium and small size blossoms set. Add these blossoms to your mold, spritz lightly with water. Run the plate through your diecutting machine to give your flowers a more realistic look. Stamp the blossoms using Versafine orange ink onto designer paper. Once done, take your Barn Door Distress ink and ink the edges of your blossom to give them more depth. Color the blossom centers with your Y18 and R46 Copic pens. Place some hot glue in the flower centers and add some Stop Whining prills to the blossom centers to form each flower bundle. Top it off using some Stickles glitter glue in yellow to give your blossoms a fun, bright flair. Now stamp and diecut your greenery using Stazon Cactus Green. 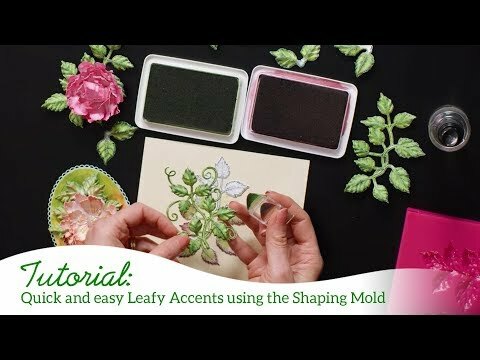 Mold the leaf and add some Zazz! Grass Green glitter glue to the leaf edges. To finish your card off, stamp the sentiment and then stamp your furry tailed squirrel using Tuxedo Black Memento ink. Color the squirrel with E30, E31, E34 Copic pens. Align your flowers along the left side of your card and add your squirrel and sentiment finishing your card off.